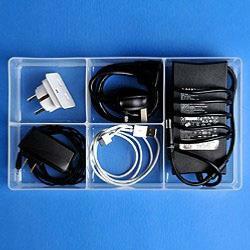 Perfect for organising cables, wires and chargers. Ideal for desk, office and craft storage. These divider storage trays are designed to be used with the 2.5 litre and 5 litre Really Useful Storage Boxes. One tray fits in the 2.5 litre box and two trays fit in the 5 litre.